This Cookie Dough Fudge is guaranteed to put a smile on your face! It’s rich, chocolaty and loaded with homemade cookie dough! Well, I hope everyone out there either had a great Mother’s Day and/or spoiled your Mom endlessly. I had a very low-key, but completely enjoyable day. My husband made me dinner and I got bunches of handmade cards from the little ones. I am fairly certain that Kindergarten teachers do this for their own jollies. Could he have not said, “Give me hugs” or “Play board games with me”? I now seem like the world’s most inattentive Mother. And while Words With Friends on my phone does seem to take up a good portion of my day I somehow feel self conscience about this when my 5 year old puts me on blast to his teacher. My friend, Anne, gets the prize, though for Most Humiliating teacher story. When her daughter got asked “What is your Mom’s favorite thing to do? ” for her Mother’s Day interview her sweet, precious daughter answered, “Lay on her bed and eat Puppy Chow”. Ok, let’s let that hang in the air for a moment. Not only does this make Anne sound incredibly lazy, it also makes her sound like some sort of Dog Food eating freak. What her daughter failed to mention was that Puppy Chow is a deliciously sweet snack that our neighbor makes AND that she had been sick the days prior to the “interview” so she HAD been laying on her bed. I am sure that the talk in the Teacher’s Lounge was on FIRE that afternoon! In all honesty, I know we all love the handmade cards…humiliation and all…because we all know that the ammunition that our children give us on a daily basis is more than enough to embarrass them for their teenage years to come. Paybacks, kids. It’s a tough lesson. Now to the fudge. To add to my day of indulgence I decided to go back to territory I have been very familiar with lately. It has been the basis to some delicious treats as of late, like these..and this…and of course these. The idea for this delicious fudge came from the blog Fields of Cake. I nearly fell outta my chair when I saw this post. I knew there was absolutely no way that I wasn’t making it. Not. A Chance. I made a few adaptations…I used a different fudge recipe for starters and also used my egg-free cookie dough recipe, but the ideas is all hers. First make you egg-free cookies dough and try not not eat it! Simply fold dough into fudge and chill. 1 (15 oz) can Sweetened Condensed Milk. Combine first 5 ingredients in a mixing bowl and cream together. Add flour and stir until combined. Stir in chocolate chips. You will need 1 1/2 cups approx of dough. You might have some leftover. You can freeze any leftovers for later. 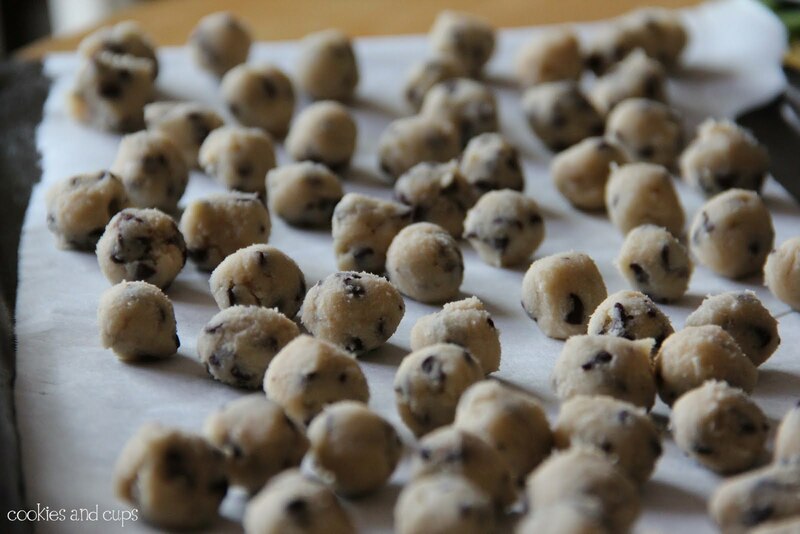 Form your cookie dough into marble sized balls. Place on a waxed paper lined baking sheet. Freeze for at least 15 minutes. The longer the better, so it doesn’t melt when you add it to the fudge. Butter the bottom and sides of an 8×8 pan. In a medium saucepan over low heat melt the sweetened condensed milk and chips together. Stirring continuously. When chocolate is melted remove from heat. 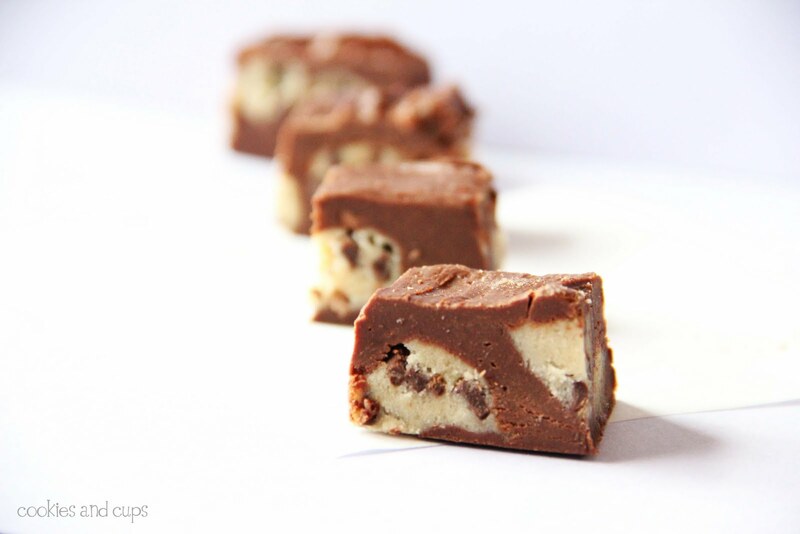 Remove your cookie dough from the freezer and carefully fold into your fudge. Spread immediately in the pan. Cookie Dough Stuffed Brownie Truffles! I had a doll named Richard, a girl doll…for some reason I just liked the name. Anyway daqent hunting one weekend so I gave her to mom so she wouldn't be lonely. Then I went to churh And told all my teachers who knew dad was gone, tha mom slept with Richard last night. One of them finally told mom months later when I brought Richard to sunday school but she cringes to think of what they thought before! Perhaps my problem with cookies is that I never really make them…because I've eaten all the dough. Hmm. you raise an interesting point. This fudge. Needs. To get in my life. I just got one of those cards from my kindergartener. He said I was 51 years old and look funny "when I have a towel on my head." I am actually glad he wasn't asked what I like best to do. I am afraid to hear the answer! I made this before and it really is awesome! These look so good! I am making them! Oh my loving God… this looks amazing. Cracking up over your kids. Mine in preschool was making out a grocery list, practicing writing, and put… "Budder and Beer" and that was it on his grocery list. I love cookie dough in anything- What a great idea to put it into fudge!! lol! too funny with your stories!! Kids say the darnest things!! What a great concept! Take 2 incredibly delicious things and combine them! Can't wait to make this! Oh what I would give for a piece of that fudge right now! MMM…looks fantastic. Little balls of yummy cookie dough encased in fudge. It's hard to imagine a better Mother's Day treat! you're killing me Shelly!! my girls have this love for anything cookie dough….so everytime I see a new recipe I have to try it!! what can i say except that i bet you're quite popular ANYWHERE someone asks for treats like this fudge! i know i eat AT LEAST 2 cookie's worth of dough before i get the first batch baked . . . ok 3 . . . well . . . i am so grateful i don't have kids in school . . .
Oh my GOODNESS!!! That looks incredible! We will HAVE to try it! Hope you had a fabulous Mother's Day Sweets! "Lay on her bed and eat Puppy Chow…" Oh my. I lost it when I read that! Too funny! Your fudge looks amazing! I don't think I've ever heard of cookie dough fudge before. Genius! Delightful! You sure know what's best for dessert! Do you sell your stuff bc you should its just amazing how creative you are. Perfectly done and looks so very yum… Happy to follow u..
WOW! This looks amazing! And you are so funny. I'm always chuckling when I read your posts! You have a darling blog. I love the header! This looks sinful! Words with friends is probably as addictive as this fudge is. Happy mother's Day. I love your Mothers Day story! My card said (for the question what is your mums favourite thing to do) "Play on her Iphone and watch TV"
I wonder if your readers would benefit from a good resource for cookie dough fundraising ideas? There are tons of different cookie dough fundraisers to consider. But not all cookie dough fundraising programs are the same. Oh my..this looks very dangerous and I must have right now!!! The survey answers cracked me up!!! Wowie, this fudge looks amazing! To die for! Forget the knife for slicing, give me the pan, my sofa and some trash reality TV and I'll be comfortably planted for a full 24hours! You had me at cookie dough! Holy cow your site is dangerous… these look so yummy!! Can't wait to try them. New follower here! Can't wait to explore around more. P.S. what font is the cookie dough one.. so cute! Wow….these sounds fantastic! Now I'm hungry for sweets! These look amazing! I'm so pleased to have found your blog – such an inspiration. These stories made me laugh and reminded me of when my nephew was in kindergarten. (The back story is that my parents are raising my nephews). But for this same type of questionnaire, the question was when does mom look the most beautiful.. five year old nephew responded with 'when she gets out of the shower'. We still tease him about this.. he is now 14! I needed a good laugh. I know this post is a year old but it was funny and the fudge mmm. I am definitely making this. I have been looking for a good fudge recipe and I have to make this. My niece would love it she is a cookie dough fanatic. Thank you for sharing.